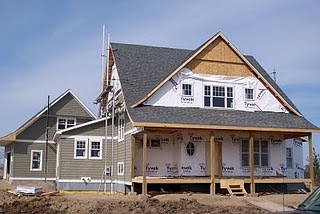 With all the homes on the market these days, new home construction has slowed dramatically – that is no secret. And some say that it is ‘greener’ to buy an existing home rather than building new. While this may be true in some circumstances, it is not always the case. Most existing homes need considerable remodeling to make them desirable and functional to the new owners – there is waste and the purchase/production of new materials involved. And what about energy efficiency? Most older homes will require new heating and cooling systems and their ductwork can be sub-par, not to mention the possibility of older windows and the gaps in the building envelope contributing to a loss in efficiency. While I love a good “fixer-upper”, I am also excited to see the progress that is being made in new construction and the focus on building better, healthier, more functional structures for living. This entry was posted in Blog, Energy Efficiency, Green Building, New Homes, Remodeling on May 27, 2011 by Emily.